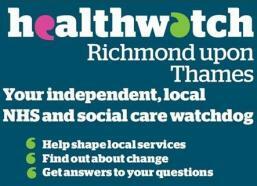 We are delighted to announce that for this event only Richmond Healthwatch has agreed to sponsor the evening. This grant is part of their grassroots engagement project and in return for their financial contribution those attending will be asked for feedback with regards to their experiences of the NHS. They approached us as they are particularly interested in collecting information on our experiences of maternity services including pre- and post-natal support for higher risk pregnancies. Thanks to the grant they have awarded us, the costs of attending will be minimal. Everybody who comes along will be expected at some point in the evening to take part in a focus group discussion or if they prefer more privacy when discussing medical experiences there will be the option of one-to-one conversations with a Richmond Healthwatch staff member. Although our treatment packages are now sold out we still have a few places left for our manicure/pedicure packages which are free to paid-up members and £5 to non members. Included in these packages are either a manicure or a pedicure, drinks & nibbles and use of the hot tub. A wonderful way to relax and catch up with other mums. You can book by contacting Jo Humphreys or Claudia Bruen.